Caro Oresteia spent her life waiting to be called by the river god, as those in her family had been for generations. But when she’s swept away on an adventure to save the Akhaian royal prince, Markos, her destiny is sealed by the sea god instead. For now, Caro is landlocked, helping Markos reclaim his throne after nearly his entire family was assassinated in a political coup. Without any financial or military support, Markos is desperate for allies, and Caro has fought off more than one attempt on his life. When a powerful Archon offers his army in exchange for Markos’s marriage to his daughter, Caro must choose: Her love for Markos, or the fate of Akhaia? And more importantly: How much is she willing to risk to defy the sea god’s wishes and chart her own course? 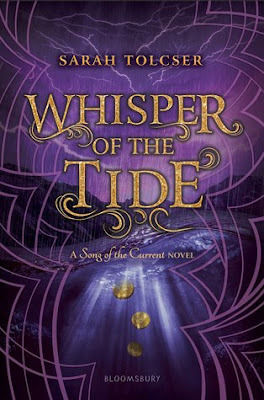 With shipwrecks, lost treasure, old and new enemies, dark magic, and breathtaking romance, Sarah Tolcser weaves another epic story about chasing your fate. After reading Song of the Current, I was DYING to get my hands on the sequel! I am so excited that I FINALLY read it and it was so much fun! This book was full of adventure, badass moments, romance, banter, and so much more! One of my favorite things about this book was the high-stakes feeling that was weaved into every chapter. The plot of this story kept me on the edge of my seat! I was always dying to know what was going to happen next and I was constantly clutching my chest in fear for my favorite characters. The author did a great job at creating an exciting book that never lost its momentum! I was happy to see all of the characters, old and new, develop A LOT in this book. The author really focused on fleshing out the characters in this story, which made them even more lovable than I thought possible! I seriously loved all the characters in this book! Each character is memorable and perfect in their own charming way. If I had to pick a favorite character though, it would definitely be Caro. Caro is such a witty and badass female. SHE IS MY QUEEN AND I LOVE HER!!! The romance was just as swoony and lovable as ever in this book. I loved the romantic development and the steamy moments that resulted from the development! My only issue with the romance was the LACK OF COMMUNICATION! The communication issues lead to some angst, which I know keeps the relationship interesting, BUT I JUST WANTED THEM HAPPY AND IN LOVE! This book was the perfect follow up to Song of the Current! Fans of the first book will not be disappointed with this sequel!